The classic hot chocolate recipe hand blended with Ecuadorian raw cacao powder. Hand blended Ecuadorian raw cacao powder, coconut blossom sugar and Madagascan bourbon vanilla; the result is a classic by anyones standard. Allergy information: Contains no milk solids or such nonsense, so totally dairy-free and perfect for Vegans. 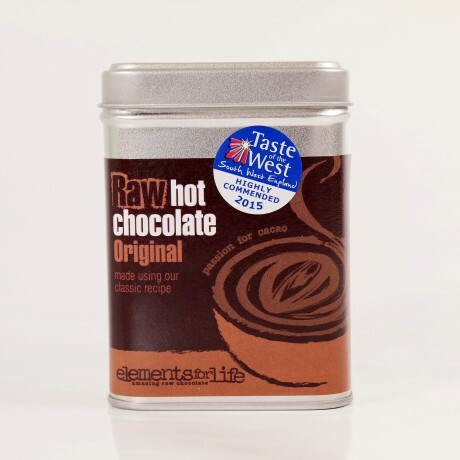 How can hot chocolate be raw? Simple; don't heat your milk too much! Just gently warm some milk, our favourite is oat milk as it makes the ultimate thick n creamy hot chocolate, stir in to the hot chocolate blend, then sit back and enjoy. Too hot for hot choc? Just add your milk of choice, the hot choc blend and a couple of ice cubes to a blender and blitz away. Instant raw chocolate shake! This product is dispatched by Elements for Life. This item has a shipping weight of 175g.